Borderlands 3 is coming to PlayStation 4, Windows PC, and Xbox One on Sept. 13, developer Gearbox Software and publisher 2K announced on Wednesday. 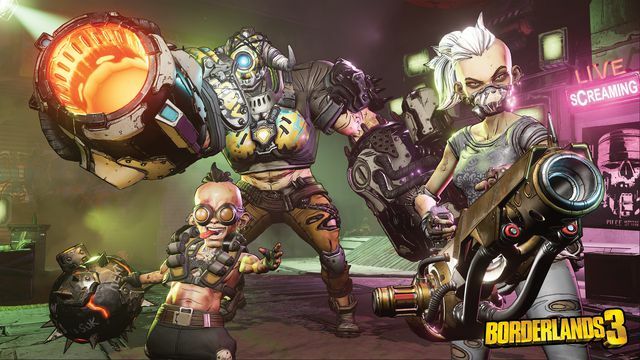 The PC version of Borderlands 3 will be exclusive to the Epic Games Store until April 2020. A new trailer for Borderlands 3 highlighted the four new playable Vault Hunters and the evil duo they’ll go up against, the Calypso Twins. More details about the game are promised on May 1, when Gearbox will hold a gameplay reveal event livestream. Gearbox also teased “new worlds beyond Pandora” where players can loot for the series’ trademark “bazillions of guns,” including firearms with self-propelling bullet shields, rifles that spawn volcanoes, and guns that grow legs, hunt down targets, and verbally insult them. A new leveling syncing system will also make playing cooperatively with friends regardless of your story of experience progression, according to a fact sheet. The fact that this game is exclusive to Epic Games launcher, I will not be getting it until it comes to steam, IF it even does. Pre-ordered my Super Deluxe Edition with GAME yesterday, which comes with an exclusive Bandit mask!